Among the cities along the Rhine, Bonn probably has the most charming vibe. It seems to be more laid-back than the other highly-industrialized cities in the populated Rhine-Ruhr region. Hosting an institution like the University of Bonn which bequeathed the world with influential thinkers like Marx, Nietzche, seven Nobel Laureates and a pope, there is no doubt that this could be the smartest city in Germany. Bonn is not as imposing as most major cities that have plenty of things to boast about but with an intelligent population, the city is quietly taking over the world before we know it. Visiting the city, I really did hope to have a taste of whatever it is in this city’s air or tap water that makes geniuses, hoping some of it will rub off on me. 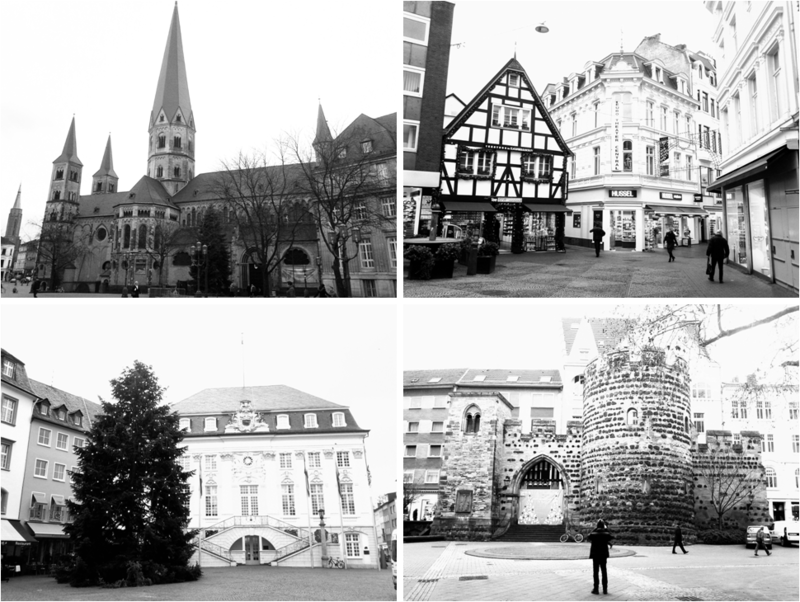 Clockwise from Top Left: The Bonn Minster minor basilica, typical street in the old town center screaming Germanic architecture, Sterntor remains from the medieval times, and the Rathaus at the market square. And who else could be the symbol of Bonn than the famous deaf genius musician Beethoven whose music transcended generations? His house here in Bonn is a humble home, turned into a small museum along a small street which could be easy to miss. Probably it’s not the best museum around but definitely a haven for his classical music crazed fans. The small historical center also helps one to imagine how life once was during Beethoven’s time. Typical renaissance revival architectures dotted by half-timber houses and medieval remnants are a pleasant sight although not overly flamboyant to keep the unspoken theme of humility to propagate the city. I came with a friend for the New Year vacation so there were not a lot of students (and people in general) in sight but I can just visualize how dynamic this city could be on a regular school day. I can just imagine the students sprawling across the wide University lawn and the surrounding cafes for some serious reading or educational conversations. Yes, I think it is very easy to feel dumb when you finally know you are breathing the same air as Nobel Laureates. With a simple environment and without plenty of extreme distractions, I could understand why this city is teeming with intellectuals. It was definitely a meaningful detour after losing on things-to-do in the much more visited city of Cologne (just less than half an hour trip!) And don’t worry, I can personally attest that they won’t quiz you as you get off the train station. As dumb as I am, I was able to penetrate the city so you should go visit before they ratify a strictly only-intelligent-people-allowed-in-here policy.